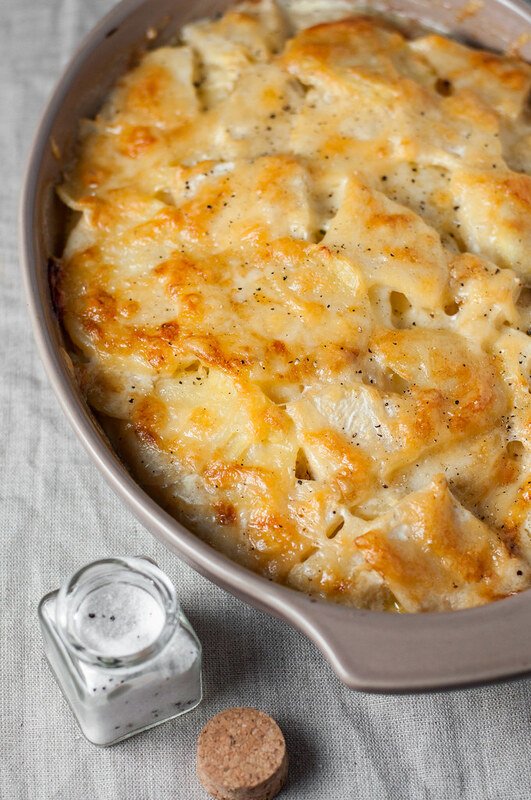 This week I went a little crazy and made two gratins–this potato and celery root gratin sprinkled with insanely tasty truffle salt, and a “side dish” of provencal tomato gratin from Ina’s Foolproof cookbook. Oh, and I made dessert. Not just some throw-together gluten-free number to make a dent in the giant bag of almond flour occupying my refrigerator, but over-the-top, fluffy, decadent chocolate cupcakes topped with thick peanut butter buttercream. What inspired this all-out vegetarian meal at home? 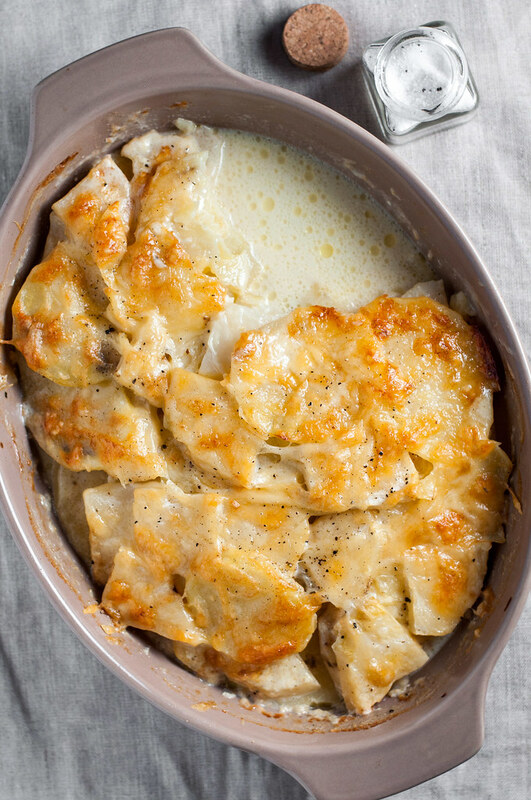 Much of the time, the featured gratin is the main event, and I throw together a salad or cut up an apple at the last minute to round out the meal. This time, I was itching to spend quality time in the kitchen after almost two weeks off from most cooking. I spent my trip with Steve to Dallas primarily in a hotel watching it rain outside, followed by our first week home eating through our overflowing freezer–lentil stew, winter minestrone, and lots of sweet potato egg bake. And there’s still more to go. Aside from my craving to chop, peel, grate, and saute the nearest vegetable, though, I had a self-contained cookbook revival. After the work week spent in Dallas, Steve and I rented a car and made the fascinating drive up to OKC to visit my sister, Toryn, and her hubby. While the boys made it their mission to clean out a case or so of “banquet beer“, me and Tor relaxed on their little back patio on a sunny Sunday afternoon with a couple glasses of wine and a big ol’ stack of cookbooks. Despite intentions, leisurely cookbook perusal (i.e., when I don’t have 30 minutes to plan dinner or an entire menu for the week) is lacking when I’m home. I got so hungry with Tor stopping to show me an Ina recipe every other page that I did something about it, that something being this dinner pulled from three different cookbooks. After our cookbook relaxation time, Tor and I headed inside for a lesson in her first risotto–aka, she sat on the counter with wine while I stirred risotto. Call me if you ever need a lesson. Anyway, we ended up with a crowd-pleasing leek and mushroom version which I’m itching to scale down for two and post on the blog at some point. When that will be, I’m not entirely sure. Maybe you noticed I was a little absent from the blog and social media this week. Well, I wasn’t making sourdough the whole time. I’ve been busy prepping my taxes as a first-year small business owner, and boy am I thankful that I’ve got some experience in the matter! Seriously–hours of reading just to try to decide if my little Ikea photography cart and food prop storage is a depreciable asset. I’m also available for tax help at an exorbitant hourly rate (much higher than the risotto lessons, and without wine). And speaking of small business, you may not have noticed before, but I’m also a personal chef, which brings me to my real excuse for the slow flow of new recipes. I love the blog, but more than anything, I love to cook, and two people just cannot eat as much food as I want to make. So, in the coming weeks, I’ll be spending some time beefing up the personal chef info here on the website as well as taking on a client or two. In the meantime, as I develop and test menu plans for clients, I’ll have some new material for quick, easy, healthy dinners that I’ll be sure to post for you. They may come only once or twice a week, but I will keep them coming! I’m not goin’ anywhere as far as the food blog is concerned, but I just wanted to keep y’all posted on life and cooking things and the evolving form of NCK. Sidenote: as post frequency varies, I was considering switching the emails that my subscribers get. If you subscribe, tell me, would you rather keep getting a single weekly update, even if it contains only one new post for a given week? Or would you rather get an email every time I post a new recipe, as often as three times per week? I’ll try to keep the emails informative and not at all annoying! Any other feedback on the format is always welcome, too. Don't worry, the truffle salt is optional, but it doesn't cost anywhere near as much as its mushroom source. If you do make the investment, you'll find yourself throwing a pinch on almost everything you cook. Rub cut side of garlic all over the inside of a shallow, 2 quart baking dish, then grease with the butter. Preheat oven to 375 degrees (F). Place garlic and 3 cups water in a 3 quart or larger saucepan or pot. Peel celery root (with a knife, not a vegetable peeler) and add peel to the water. Place steamer basket in pot and heat to a boil. While water heats, quarter celery root lengthwise and slice thick, about ¼". Add sliced root to steamer basket, cover pot, and steam 5 minutes. While root steams, peel potatoes and slice thin (1/8" or less). Remove steamed celery root to a large bowl, add potato slices to steamer basket, and steam 3 to 4 minutes, until tender but not fully cooked. Remove to bowl with celery root, separating big groups of slices. Strain ¾ cup of water from pot through mesh strainer into a 2 cup liquid measuring cup (or medium bowl). 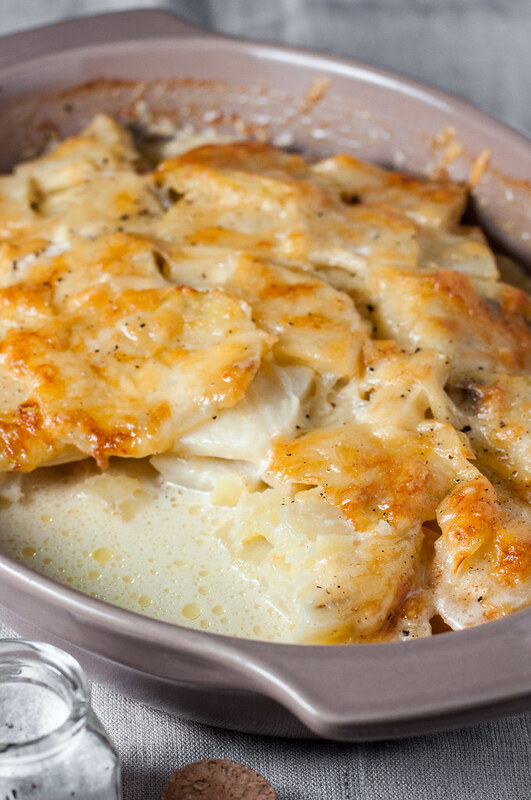 Let cool while you grate the Gruyere--you should have about a cup grated. To the water, add cream and dijon and whisk to combine. Season with salt and pepper (you can always add more pepper when serving). Pour over root vegetables and toss gently to combine (tongs work well for this). Pour root veg mixture into prepared dish, sprinkle with a bit more pepper, and top with grated cheese. Bake about 30 minutes on middle rack, until bubbly. To brown top, broil for a minute or two. Sprinkle with truffle salt before serving, having extra truffle salt available at the table (but warning first-timers, like myself, of its richness). Nutrition notes: As written, gluten-free and vegetarian, if vegetarian cheese is used. 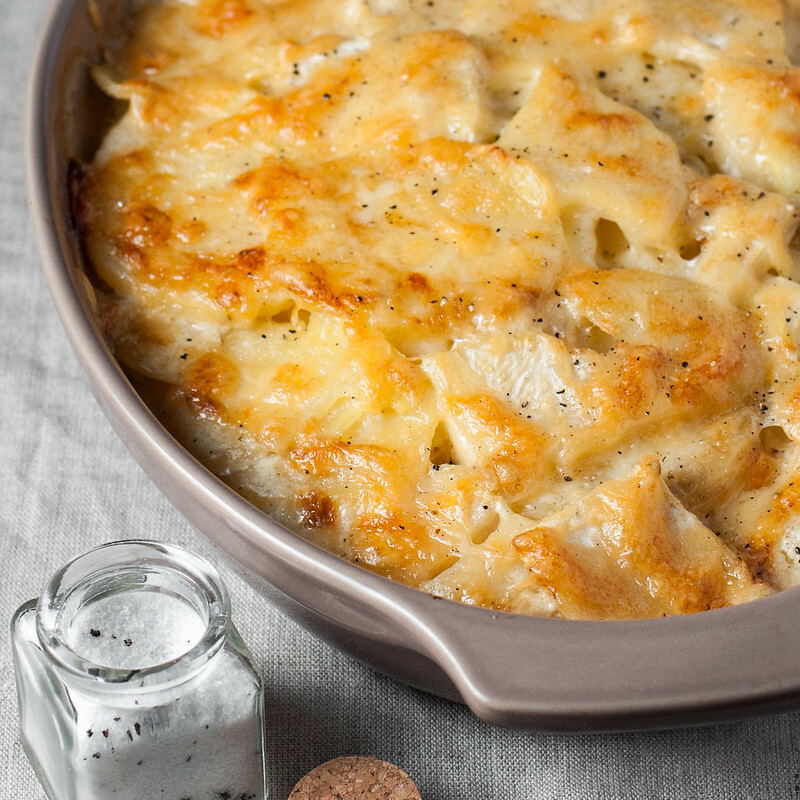 This is also a particularly decadent gluten-free potato gratin. Steamer baskets are inexpensive and can often be found in the cookware or produce section at the grocery store. Call me an amateur, but I purchased one for this dish and am sure it will get lots of future use. This video taught me the best way to peel celery root. Note: This page contains affiliate links. It does NOT contain sponsored content. Affiliate links (to products I recommend, on Amazon) offset my ingredient and website maintenance costs, so I can keep bringing you earthy recipes like this one. Thanks!